Plants-weeds are the worst enemies of not only vegetables, but also ornamental grass grown in lawns. The most effective means to combat them are herbicides of continuous action. Annuals-weeds it is possible to deduce from his infield, through regular mowing or recurring homeland problem areas. If in the garden or on the lawn infested with perennial plants-the weeds, here without the use of herbicides as more radical measures are not necessary. 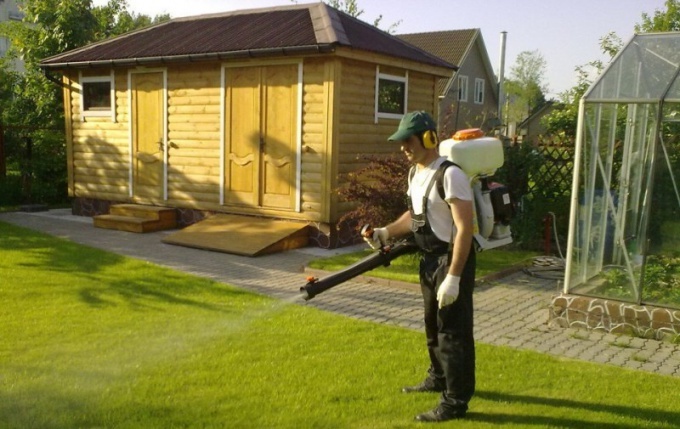 The herbicides of continuous action are popular among gardeners and gardeners tools like "Tornado", "roundup", "Napalm", "Errokiller", "Lontrel 300". This is a real "killer" weed, and they must be used only in accordance with the regulations. The principle of listed chemicals is quite simple – when spraying the particles of the herbicide to enter the weed, after some time gets inside and absorbing all living cells, tend to the root system. Thus, the tool acts only on the plant itself, without polluting the earth. If all particles of the herbicide hits the ground, just two or three weeks there will be a process full chemical breakdown in safe for all the surrounding particles. You must understand that using herbicide, you can inadvertently get the poisonous air and on turf grass, which will lead to their death. Therefore, before spraying, should cover the grass with plastic wrap. Herbicides continuous action, usually sold in specialised shops for gardeners and are quite cheap. In sale the funds are received in containers of 100 g, 200 g, 500 g, 1 liter to make 10 liters of working solution, which is enough for effective weed control in the area of 20 sq. m, enough to thoroughly mix water 100 g of product. After spraying the first signs of aging appear on the stems and leaves of plants after 3-4 days, even after 2-3 weeks the plant dies completely. It is important to know that working with a solution of herbicide should be extremely careful to prevent foreign substances on exposed areas of the body, as well as in the respiratory system. When spraying wear a respirator, rubber gloves on his hands and feet rubber boots. Herbicides continuous action (especially the "Napalm" and "roundup") are very popular with owners of land, so buying them is necessary until the season of garden work. In the middle of the season, the gardeners literally sweep this product from store shelves.